This is my second installment detailing the bridges and structures of a great American river. In this survey, we visit the bridges, locks, and dams on the Saint Croix River. This river forms the border between the states of Minnesota and Wisconsin for 125 miles. It starts in an area of springs and bogs near the small town of Solon Springs, Wisconsin. The Saint Croix flows south, passing near the Twin Cities, and merges into the Mississippi River at Prescott, Wisconsin. The river was historically important to both the Indians and early trappers as a transportation route. The river again became important to the national economy in the late 1800s during the harvest of the virgin white pine. That came to an abrupt end in 1912 when the timber ran out. Since that time, the Saint Croix has become an important tourist attraction. The federal Wild and Scenic River Act was passed just to project the Saint Croix River. Today, the Saint Croix is a major recreation area that is closely protected by both the states and local residents. The Saint Croix river was formed relatively recently in geological terms. During the last ice age, a glacier blocked the south end of Lake Superior, forming glacial Lake Duluth. As the ice retreated, Lake Duluth broke though its banks to the south and started to drain. 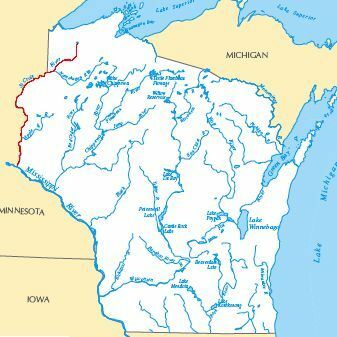 The water rushed to the south cutting first the Saint Croix valley, and later the Mississippi River valley south of Hastings. Once the glaciers melted and Lake Duluth was empty, a small rise of land divided the Saint Croix river near the present day town of Solon Springs, Wisconsin. At this point, water on the northeast side of the divide flowed though the Bois Brule River to the north into Lake Superior. Water on the south and west side of the divide flowed south on the Saint Croix River, then flowing into the Mississippi River at Prescott, Wisconsin. This divide is not a hill or a mountain, rather it is no more than a matter of a few inches in a swampy area at the north end of Upper Saint Croix Lake. This swampy area sits in the river valley carved by the glacial river flow. In contrast to the divide being only a few inches in elevation, the river valley is over 100 feet deep.